This basket has been on my to-make list for a long time and when I saw Svetlana's version the other day, I bumped it up to the top. Pretty much the reason that I had put off making this project is because I hate interfacing (this project calls for SF101 and fusible fleece), but in the end the interfacing was minimally obnoxious and definitely makes a big difference in the finished project. The entire process of making this was so fast! When I got to the last step I thought to myself, "Wait, that's it?". My topstitching is a little sloppy around the top because I got a little lazy about the ironing, but it's nothing I can't live with. This will definitely be my go to baby shower gift in the future. I already put this blanket and some newborn diapers in my basket to test it out. These diapers are leftover from when my son was a baby (almost 5 years ago!) and he outgrew the newborn size in about 2 days. Diapers don't expire, do they? your basket is so pretty Erica. I too was so surprised at how quickly the basket comes together once the interfacing is attached. This is a sweet basket. Now I have it on my to do list! Terrific! 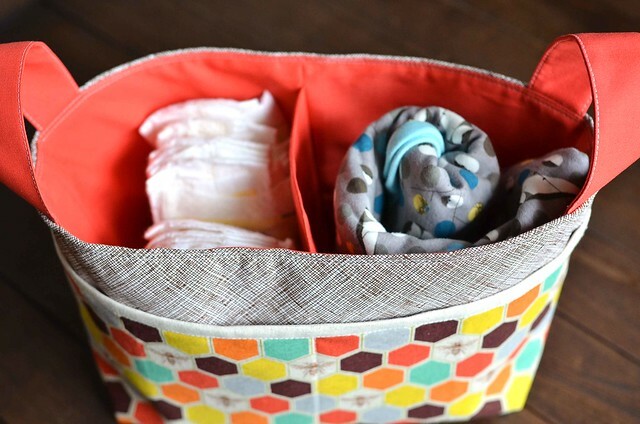 That would be a darling baby shower gift, filled with diapers and wipes. Bump, bump, bump up my To Make list, also. So adorable? I just bought this pattern not quite a month ago, but it looks hard? Can I ask you how long did it take you and was it pretty hard? This would be perfect for my sister and another shower that i have to go on that same day! Lovely basket! That Echino fabric is perfect. I must keep an eye out for it! Its adorable! I'm not a big fan of working with interfacing either but it certainly has its perks! I love that fabric and the basket turned out great! 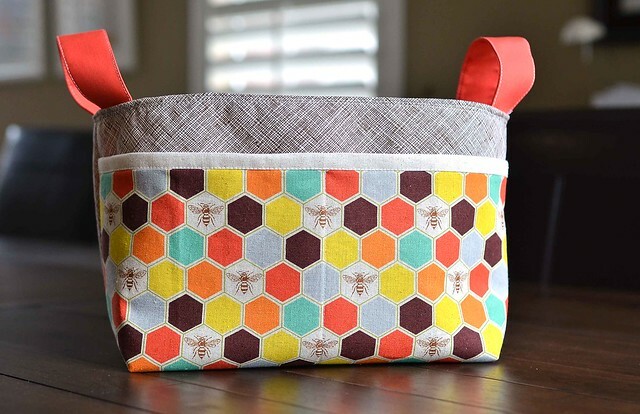 My lovely bee mate made me a gorgeous open wide zipper pouch with that bee fabric! Darling! P.S. I despise interfacing too.